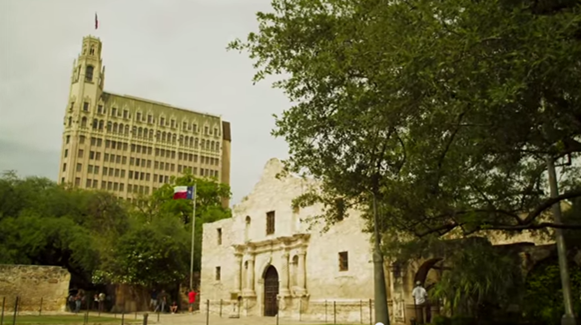 The Alamo: Hollywood fact or fiction? THERE WAS an Englishman, a Scotsman, an American and a Mexican on an aeroplane. 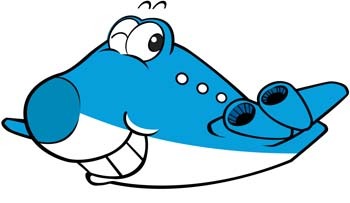 The engines began spluttering and the pilot came back and said, “We have lost power. Unless three of you jump out of the plane we will crash and we’ll all die. The problem is there are no parachutes.” The Englishman jumped up and shouted, “Remember Trafalgar” and threw himself out of the plane. The Scotsman jumped up and shouted, “Remember Bannockburn” and threw himself out of the plane. The American jumped up and shouted, “Remember the Alamo” and threw the Mexican out of the plane. 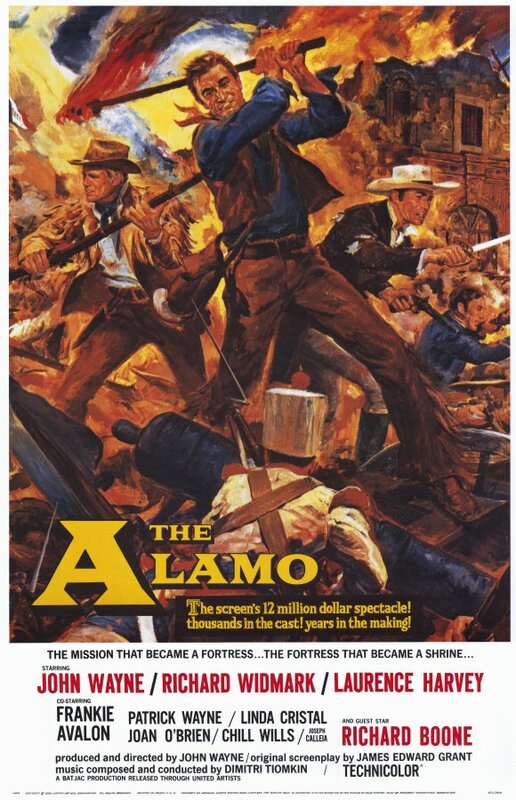 So was Hollywood’s ‘The Alamo’ anything like the true facts? Well, first of all, which Hollywood Alamo? Since 1915 there have been about 12 movies on the Alamo, the latest being the rather rambling (but slightly more authentic) Billy Bob Thornton effort in 2004. But the only great version, which most people relate to, is the John Wayne version in 1960 (okay, that’s my opinion – and yes, I’m a John Wayne fan). Big John starred in it of course, but he also produced and directed it. In fact, initially, he only intended to play the small part of Sam Houston so he could concentrate on directing but the money-providers would have none of it. And rightly so – only John Wayne could have played Davy Crockett. The Alamo – ‘fighting for freedom’ …..? So what really happened? Well, more to the point how did it come about? Hollywood will have it the ‘Texans Fighting for Freedom!’ Well, not exactly. It’s quite complex but let’s try and keep it simple. In the early 1800s there were these American ‘mercenaries’ called filibusters looking around for land and Florida and Texas, both owned by the Spanish, were targets. 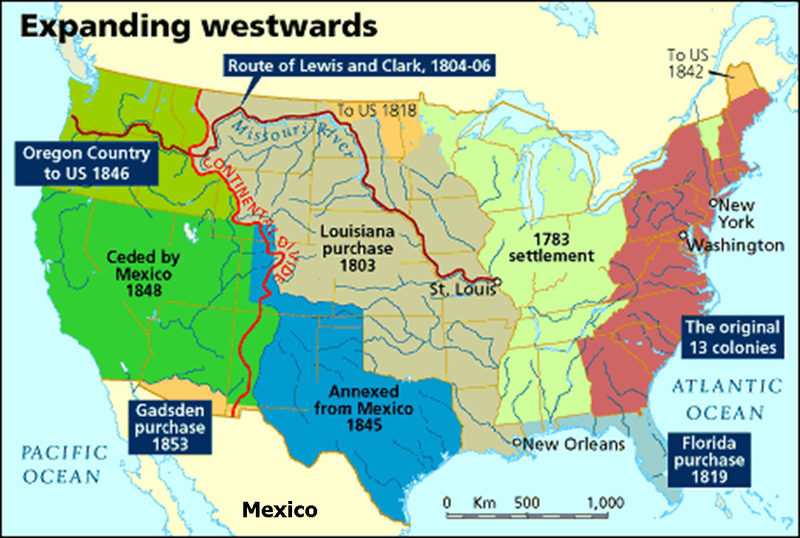 America bought Louisiana from the French in 1803 but the borders into Texas were ill-defined. In 1813, the filibusters wandered into Texas to try and redefine these borders in America’s favour but set up their own Green Flag Republic, independent of the US – and Spain. The USA was none too happy and so withdrew its support and the new GF Republic was crushed by the Spanish. 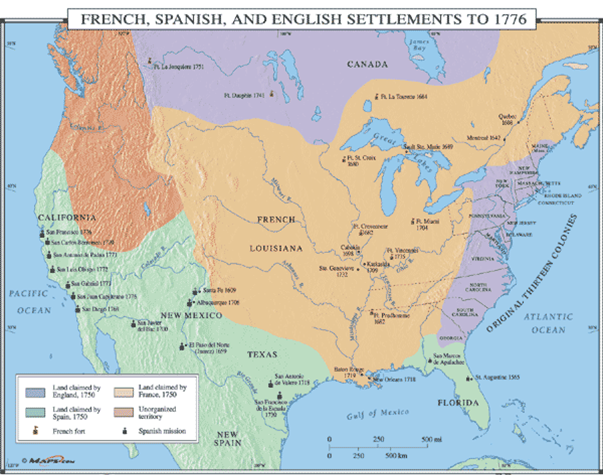 In 1819 Spain negotiated with the USA wherein the latter was able to purchase Florida in return for giving up any claim on Texas. So that is all fine until Mexico obtained Independence from Spain in 1821. And Texas became part of Mexico. There followed a flood of American settlers into Texas (Anglo-colonials) and Mexico decided to encourage this new immigration to allow the land to be developed which they were unable to do themselves (Mexican mistake no. 1). 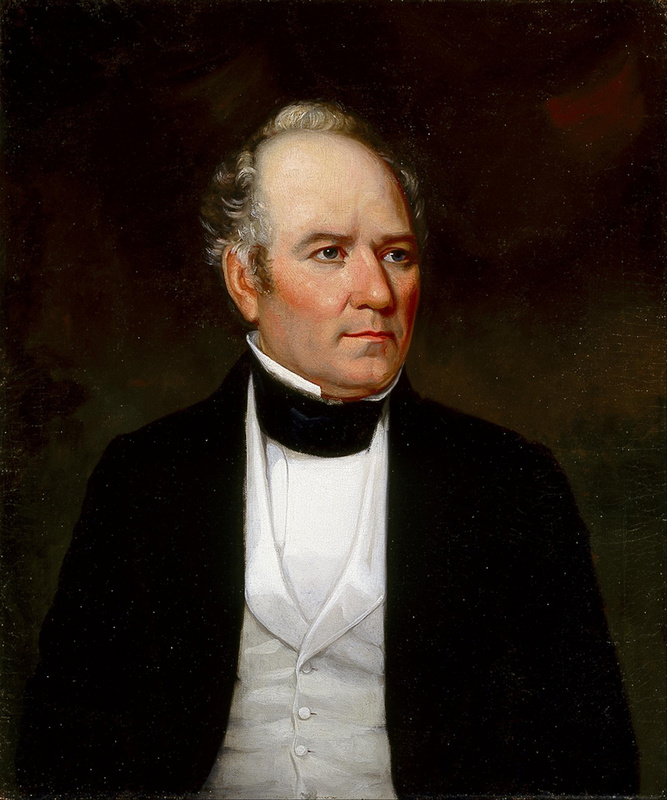 An ’empresario system’ was set up with the Mexican government by Stephen F. Austin wherein 300 immigrant families would settle in Texas (Austin’s father, Moses, had made a similar deal with the Spanish but died and then Spain gave up Texas before it all came about). Empresarios (American immigrants in Texas) were appointed by the Mexican government to sell land to immigrants at $30 (on credit) for 4000 acres (the cost in the USA would have been $5000 cash – a pretty good deal if you ask me!). In return, immigrants would become Mexican citizens and Catholic. Then trouble began. First of all, one Haden Edwards decided that he would to go independent but he was put down by Austin who wanted to keep the peace with Mexico (makes sense bearing in mind the deal). Then, in 1829, Mexico abolished slavery. Unfortunately most of the immigrants were from the southern States of America (mainly Tennessee, Kentucky and Missouri) and so had slaves themselves. But the Mexican allowed them to keep them. 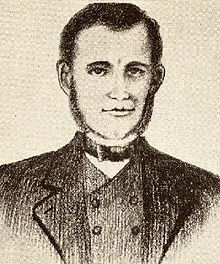 Enter William Barret Travis (played by Lawrence Harvey in the film), a lawyer who had fled his hometown of Claiborne in Alabama, and his wife and child, to avoid debt. 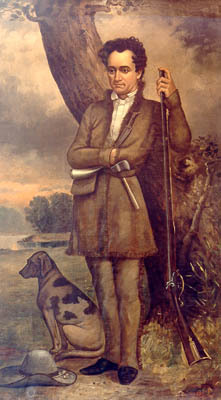 He was pro-slavery (and had with him his slave, Joe – one of the few who survived the Alamo, but didn’t appear in the film) and openly challenged the Mexican officials on the topic and was arrested. On his release he emerged as a rebel against Mexico. But alone he had little impact. If you were paying attention above, the original deal was limited to settling 300 families – we are way passed that figure now. So, in 1830, Mexico decided to curb immigration into Texas as it was concerned it was losing control. This was ignored by the American immigrants (there’s a surprise). By this time Mexico was having its own internal squabbles between centralists and federalists. Antonio de Padua Maria Severino Lopez de Santa Anna y Perez de Lebron – known as Santa Anna – (his father must have been an ardent supporter of some Mexican football team) was leader of the federalist but when he took control as President in 1833 he became a centralist, then a dictator. Zacatecas objected so Santa Anna sent a force and destroyed the city and all the inhabitants. Texas (particularly Travis) supported the federalists and was now very concerned about Santa Anna’s intentions regarding Texas (bearing in mind what happened at Zacatecas – he thought it was next). Likewise, Santa Anna was concerned about the intentions of the immigrants in Texas (independence) and decided to begin to remove their arms. This began in October 1835 with a single canon at Gonzales, which had been given to the town by the Mexicans to defend against Indians. The Mexicans marched on Gonzales and demanded the return of the canon (Mexican mistake no 2). The Texans replied “Come and get it”. There was a bit of a skirmish but the Texans held onto the canon and sent the Mexicans home. The Texas Revolution had begun. Re-enter Stephen Austin. He now objected to Mexico adding neighbouring Coahuila to the Texan State and was imprisoned for 18 months (Mexican mistake no 3). This was to also to spur the Texans to rebellion. Then enter Jim Bowie (played by Richard Widmark in the film). Whatever impression you got/have of him, he was a large scale Kentucky criminal escaping his past of land-grabbing frauds in Louisiana. (By the way, he didn’t invent the Bowie knife – he just used it a lot and the name stuck). He headed to Texas in search of more opportunities (to perhaps defraud more people). Anyway, he claimed large areas of land through the empresario system which were subsequently taken away from him by Santa Anna. This caused Bowie to support Texas independence. In the film, whilst defending the Alamo, he hears of the sad news of the death of his wife (Maria Ursula) of the plague. She did die of cholera, but three years before the Alamo. Perhaps news just travelled very slowly in those days. 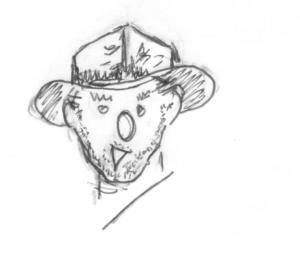 Finally, enter Davy Crockett (played by …. oh, you know). 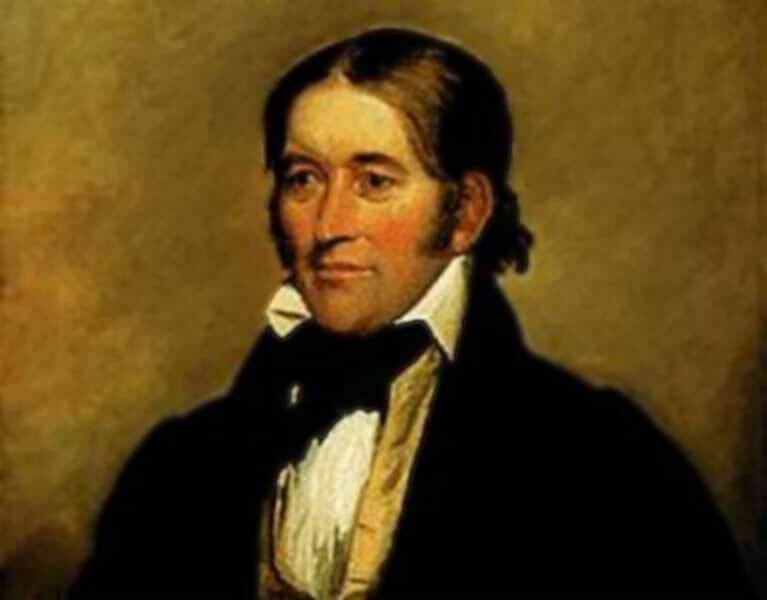 He had been elected for US Congress in 1827 and hoped for an opportunity at the presidency. Unfortunately he was not re-elected to Congress for a fourth time in 1835 and so left for Texas in the hope of more opportunities. He had said, and forever repeated it, that if he wasn’t re-elected “you may all go to hell, and I’ll go to Texas.” He wasn’t and he did. He was a true frontiersman and larger than life character. Perfect for John Wayne to play – in fact, if I was making a film about John Wayne I would cast Davy Crockett to play him – although, admittedly, that would prove somewhat logistically difficult. Anyway, I digress, Crockett joined Travis and Bowie at the Alamo to hold up the Mexican army under Santa Anna until help arrived. It did not quite work out like that. 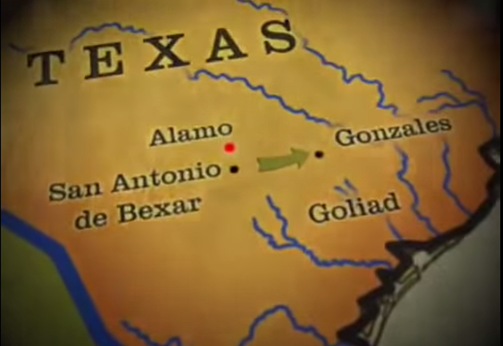 The rebels (that’s the Texans and Mexican allies, the Tejanos), led by Ben Milam, first took San Antonio Bexar (we’ll call it Bexar cos it’s easier – but it’s now just known as San Antonio – see map above). It was a five day battle and, as the rebels were on the verge of retreating, the Mexicans surrendered! But, on the 3rd day, Milam had been shot and killed by a sniper (Felix de la Garza – who was also shot and killed in return – fair’s fair). Frank Johnson had taken command. 150 Mexican casualties against 5 rebel deaths. Then the Alamo was taken by the rebels without a fight. When Santa Anna heard the news he was greatly vexed. He said, “Ungrateful rebels had humiliated their mother country” and gathered his force and marched on Bexar. 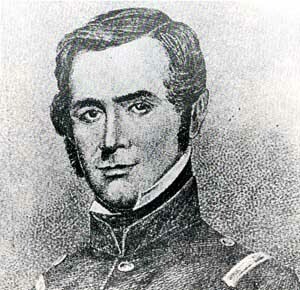 End of December 1835, Johnson left Bexar and Lt Col James Neill took command. By January he had only 85 men. Jim Bowie and 30 volunteers arrived, then Travis with his ‘regulars’. 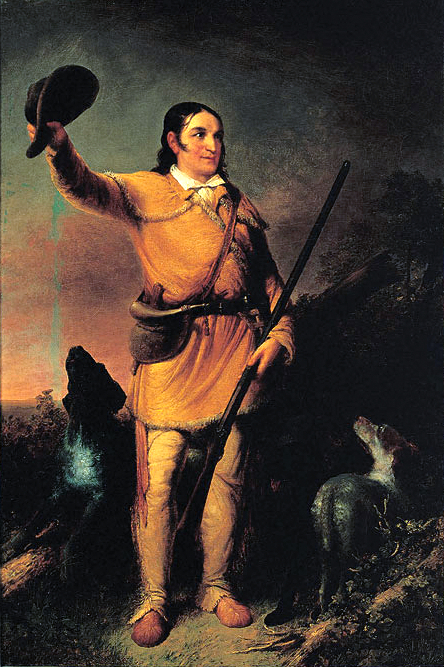 Davy Crockett and his men from Tennessee joined shortly afterwards. 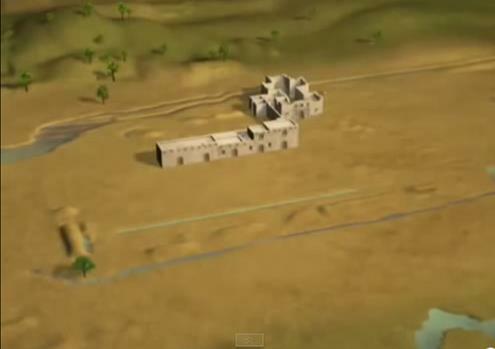 On hearing of Santa Anna’s approach the rebels vacated Bezar and headed over the river to the nearby fortified Alamo. San Antonio de Valero was originally built as a mission to Christianised the Indians (sorry, native Americans) but it was closed, unfinished, in 1794. 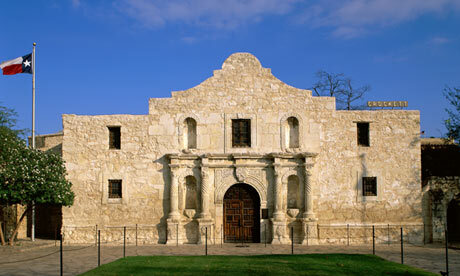 It was later garrisoned by a presdial company from Alamo de Parras, in Mexico, and renamed the Alamo. O’Neill had to leave as he had heard of illness in his family (he wasn’t stupid – get out of there asap!). Admittedly, he did expect to be back before Santa Anna’s arrival but no one realised how close Santa Anna was. Bowie was left in charge but was taken ill (possibly TB) and in no fit state to command (so, unlike in the film, he wasn’t much involved in the siege or the battle). 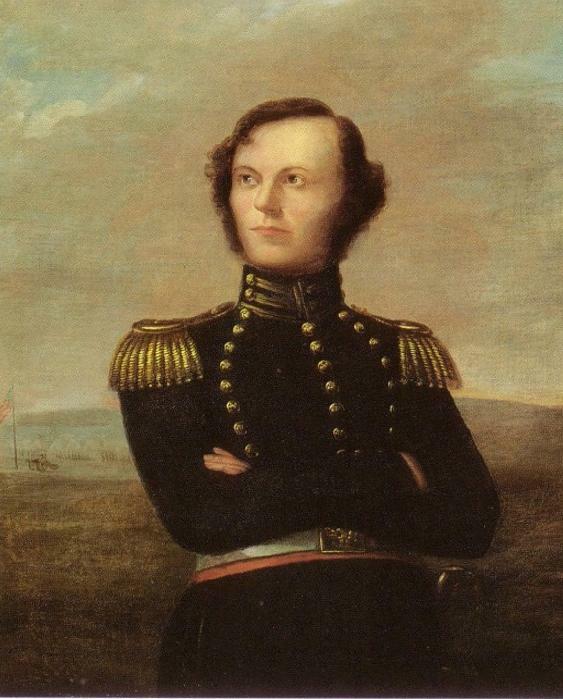 Travis (aged only 26) took over and wrote many letters pleading for reinforcement – all ignored. 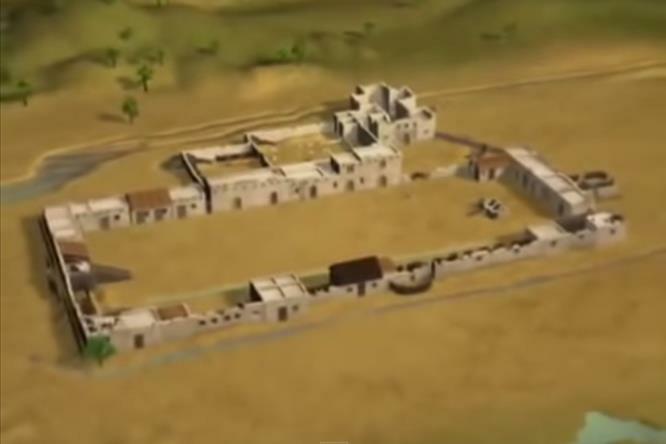 The numbers at the Alamo vary from source to source – 160, 180, 200, 250. If we go with 200 we can’t be far out. Santa Anna had anything from 2000-6000 men (that figure varies as well – he may have had around 6000 in total, but used only 2000 on the attack on the Alamo). The Mexican weakness was its artillery – it only had two 8 pounders, two 6 pounders and two 4 pounders. These were not much use for breaking up the thick walls of the Alamo. The siege began on 23rd February and lasted just under two weeks. Santa Anna could have waited another four weeks or so and starved the rebels out but he feared rebel reinforcements at any time. So the attack began at 5.00 am Sunday 6th March and lasted just about an hour and a half before all the rebels were killed. Travis was shot and killed at the very beginning; Bowie was killed in his bed, unable to move due to his illness; and Crockett was killed towards the end (it’s not known exactly where, when or how – some say he was captured and executed, but I doubt that). What is certain, unlike in the film, he was not killed blowing up the powder magazine and taking a load of Mexicans with him. Robert Evans was given this task but he was shot and killed before he managed it. The General Council (of Texas) decided it couldn’t (or shouldn’t) raise an army to send to the Alamo until it had declared Independence for Texas. This was eventually done on the 1st March but, due to numerous spelling mistakes, it was not signed until two days later! If that delay wasn’t enough, Sam Houston was involved and was to be given command of the Texan army and, after signing the Declaration, he and some of the other delegates went on a two day drinking spree to celebrate – never mind the Alamo. Santa Anna then sent a force against the rebels at Goliad (see map way above). By the time the Mexicans got there the rebels had fled, but due to the incompetence of their commander, James W. Fannin, who dillied and dallied, the Mexicans caught up with them. They surrendered but Santa Anna sent a message to execute them all – some 400 (Mexican mistake no 4). In the film, this defeat happened before the fall of the Alamo and used, by Hollywood to excuse Fannin for not coming to the rescue. In truth, he just couldn’t make a decision (at one point, he did start off for the Alamo but changed his mind). Anyway, this atrocity of the execution of Fannin’s army woke the Americans up. It sparked an out-pour of sympathy for the rebels and thousands of volunteers began their way to Texas. 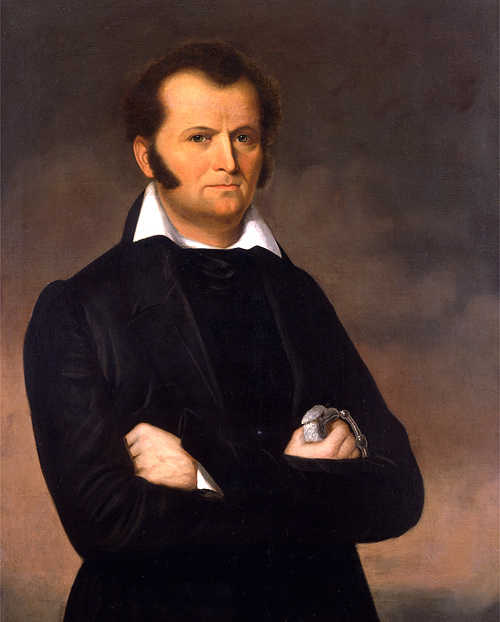 In the meantime, Santa Anna was in pursuit of Houston and his newly formed army – which, due to the Alamo, had gained time to prepare itself (despite Houston’s drinking). Santa Anna came upon Houston with only half his (Santa Anna’s) army – he thought Houston and his rabble force would be easy pickings (mistake no 5 – final mistake). In fact, Houston made a surprise attack on the siesta sleeping Mexicans and defeated them at San Jacinto river (the attack itself lasted only eighteen minutes but carnage followed with 600 Mexican casualties against 11 rebel deaths). Santa Anna was captured and used as a hostage to gain a Texan Republic under the Treaties of Velasco. Santa Anna was eventually allowed to return to Mexico where, amazingly, he remained in power on and off for several years until, in 1855, the Mexicans finally got fed up with him and chucked him out. 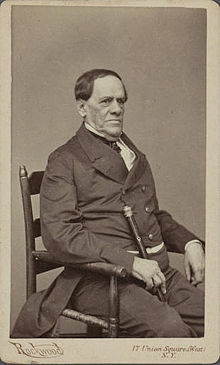 He died, a cripple (he had had a leg amputated in 1838), almost blind with cataracts, and in poverty, in 1876. Interestingly, he was a devoted fan of Napoleon and collected books, statues and images of the Frenchman. He was especially proud of his own nickname ‘Napoleon of the West’ after the Telegraph and Texas Register referred to him as such. Which part of the minor detail that Napoleon lost did he miss? Texas became the 28th State of the USA in 1845 but Mexico had never accepted the Treaties of Velasco as valid. This led to the Mexican-American War of 1846-48 when Mexico was finally defeated. 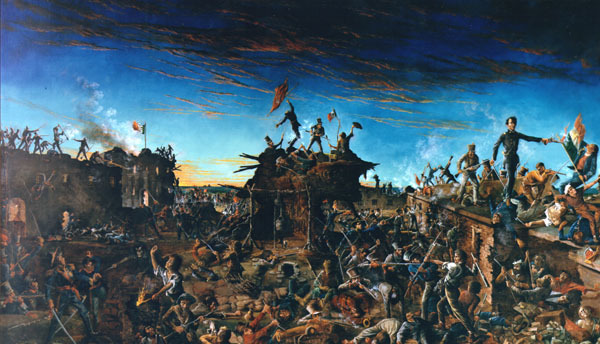 So, was the Alamo about ‘Texans fighting for freedom’ as the film depicts? Well, ‘freedom’ can sometimes be muddle with self-advancement at the expense of someone else. However you argue it, Texas belonged to Mexico and the Mexicans did a noble thing in offering land to a limited number of immigrants (300) at a ‘next-to-nothing’ price in return for becoming Mexican citizens. That ‘limited number’ was ignored by the immigrants and eventually they demanded independence. Fair or what? Okay, Santa Anna was a despot and a tyrant so only had himself to blame. 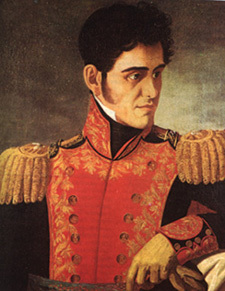 The rebels argued that “legitimate political authority rested on the consent of the governed, who had the right to withdraw that consent and change their government if it threatened those inalienable rights it was formed to protect.” As they saw it, that was exactly what Santa Anna (the government) was in the process of doing. Well, that’s okay if your country is run on a democratic process, which theirs (Mexico) was not. If such an argument is to succeed then the whole of Mexico should have rebelled against Santa Anna, not just a bit of it. Oh well, that’s politics ……. or is it just land-grabbing? It must be an ‘American thing’ – a few years before the Alamo, around 1775-83, didn’t immigrants in America demand – and take by force – independence of a country that belonged to someone else? ….. but we won’t go there. Alamo trivia: One of the women survivors was Capt. Dickinson’s wife, Susanna Dickinson, and also their daughter, Angelina (named Lisa in the film and played by John Wayne’s daughter, Aissa). Other than Travis’ slave, Joe, who was also allowed to leave, Susanna was the only one able to say what happened at the Alamo – but, like Joe, she didn’t see very much. Nor did she grieve for her husband (who had died at the Alamo) very long, remarrying the following year. That didn’t last and the year after that she divorced him for cruelty and married again. That husband died of alcoholism, so she married a fourth time in 1847, but that ended in divorce due to her adultery. Then she married a fifth and final time in 1858, which lasted to her death in 1883, aged 68. Her daughter, Angelina, was certainly as active, but not as fortunate. She had two husbands and four children before becoming a prostitute and died of a uterine hemorrhage in Galveston, in 1869, aged 34. I wonder if John Wayne bothered to check what she became before he cast his young daughter in her role?! Lisa (actually Angelina) (played by Aissa Wayne) on mule with her mother, Susanna Dickinson, leaving the Alamo at the end of the film. One of my new colleagues came into my local hostelry and ordered three pints of bitter and sat next to me. I admitted that this was a jolly nice custom, and left it there. He became a regular in the bar and always drank the same way – ordering three pints and drinking from each of them in turn. ← Lawrence of Arabia: Hollywood fact or fiction?